It's easy to be charmed by the lazy, summery feel of Burnt by the Sun. And then it's easy to be horrified by the darker undercurrents which run beneath that charm. A film which tackles (some would say, exploits) the ugly Stalinist purges of post-Revolution Russia, it is an emotional wringer. 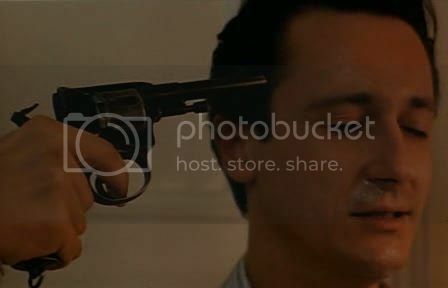 It also won awards and accolates at both Cannes and the Oscars, though it continues to polarize audiences - mostly because of director/writer/star Nikita Milkhakov's controversial celebrity. Yet in spite of its awards, mistakes and controversy, Burnt by the Sun is often a very beautiful, moving film. 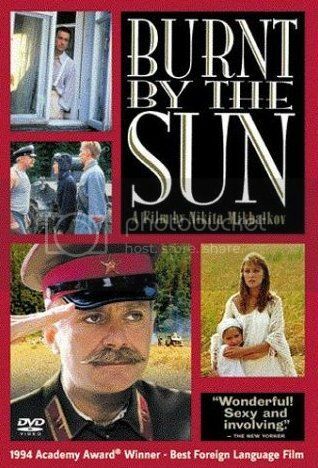 It takes place in 1938, where heroic old Colonel Kotov (Nikita Mikhalkov) is vacationing at the family summer home with his young wife, Marusia (Ingeborga Dapkunaite), gorgeous little daughter, Nadya (Nadya Mikhalkov, the director's real-life daughter) and assorted set of what EVERY reviewer is legally bound to call "Chekovian" characters. Just think white linen pants, croquet, sleepy afternoons, buzzing mosquitos and dainty umbrellas. Think also idiosyncracies, mild arguments and a general feel of casual, chaotic affection. Until in walks old family friend Mitya (Oleg Menshikov), a flamboyant prankster and handsome young man who immediately triggers major alarm bells between Kotov and Marusia. With vague allusions and eerie shots of Marusia's scarred wrists, we learn that Mitya was more than a family friend - on the contrary, he once enjoyed Kotov's privileged position as Marusia's great love and beloved scion of the family clan. But after indeterminate misadventures during the revolution and civil war, Mitya lost that position. His return now is both unexpected and mildly threatening; his strained smiles hide an eerie malice and a deep self-loathing. Things take a turn for the worse when we learn that Mitya's arrival is not merely a personal visit. The emotional impact of the story largely explains its success, we reckon. Witnessing the easy love within the family, coupled with the pitious loathing of Mitya as an "outsider" and forced villain, is - for the most part - very poignant. Nadya also injects a lot of genuine cuteness; she is cheeky and beloved by all, most of all her father, and there are numerous scenes which focus only on that special bond. This may sound indulgent or cheesy, but some moments - such as when Kotov takes his daughter on a boat ride - are wonderfully touching. Nadya circles her small arms around Kotov's neck, burying herself there, and sighs, "You have no idea how wonderful I feel when I'm with you." The film's most gorgeous scenes. 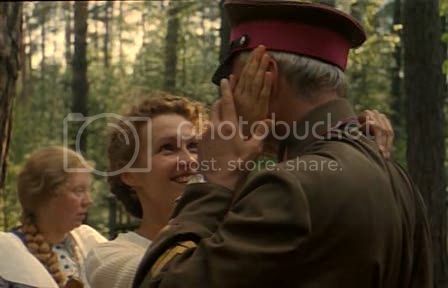 The human details are the most affecting, and, while Mikhalkov's Kotov is a sort of overly perfect primordial War Hero (and, yes, it's an ego trip), his performance - as well as Nadya Mikhalkov's, Oleg Menshikov's and Ingeborga Dapkunaite's - are generally pitch perfect. People have talked a lot about the unexpected magic(al) realist touches in the film - such as when the titular sun becomes literal, a floating orb that scalds the surroundings - but these are brief missteps in a beautiful waltz. I've been waiting twelve years to find someone to discuss this with: did you notice that the little girl said the word "uh-huh" in at least one spot and (I think) "uh-uh" in another? (or possibly the closed mouth "uh-uh": "mmh-mmh." Like I said, it's been twelve years). I've always wondered, if they were all speaking Russian throughout the movie and it was set in 1938, why did a four-year-old Russian girl utter what I've always thought were English language mumbles? ("uh-huh" for yes, "uh-uh" for no). Was it a mistake of anachronism/inadvertent bilingualism by the actress, or would those (non)words really have been used and understood in Russia in 1938? How universal are these utterances? It's very hard to do any sort of reasearch on a topic this insane, so I'm hoping you noticed and have some ideas. PS. I loved this film - so dreamy, makes me want a dacha - but so tragic. 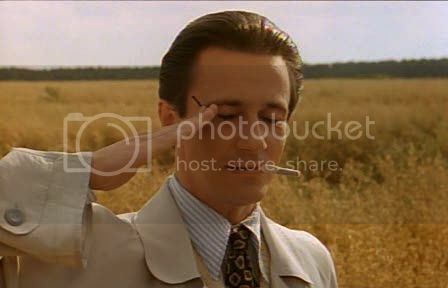 I heard about the magic realism touches before I saw the film and I thought they would be more obtrusive than they were. SpyGirl - D'oh! You out-observant-ed me! I never noted adorable little Nadya's Americanisms (if they are Americanisms? hmm, I don't know either, to tell the truth), mostly because I was floored by her absolute, incredible cuteness. I do, however, have some Russian/Russian-speaking friends, so I will investigate! If it's any evidence, I read an article about this that said that apparently Nikhalkov invested a lot more fussiness into getting the correct historical details than people give him credit for. Uh-huh in Russian is actually aga, ugu, or very similar sounding utterances which are not American or English at all. So yes, they would have definitely understood uh-huh in 1936 because it's part of the Russian/Slavonic/European languages and did not, in fact, originate in America.